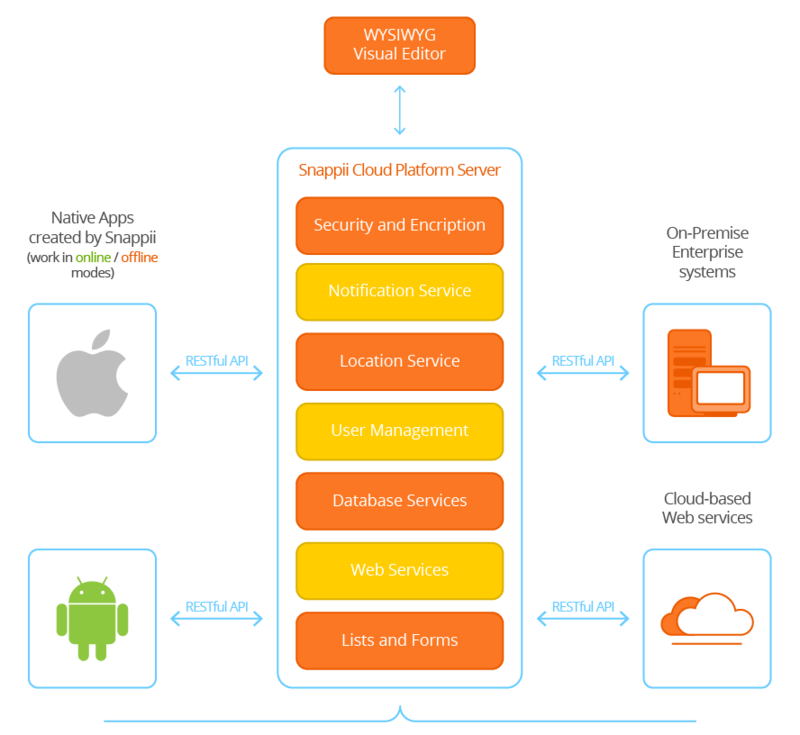 Snappii is a cloud based mobile app building platform that enables rapid development, testing, deployment, new version distribution and analysis of all apps. 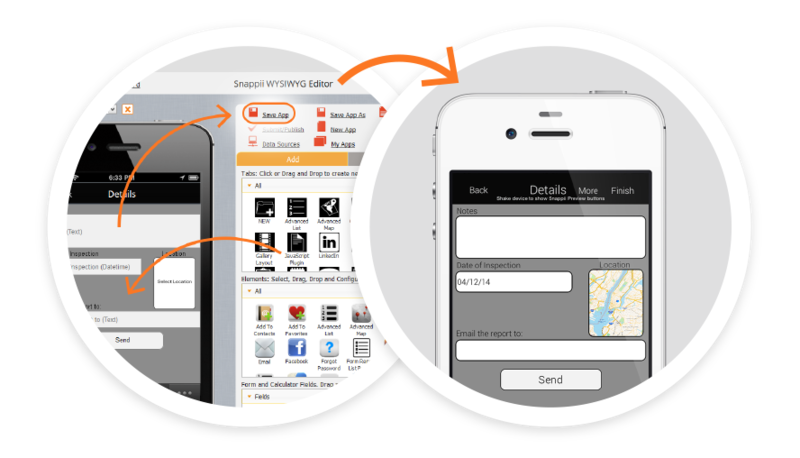 Building apps visually dramatically speeds up app development, updates and changes. Apps are published and distributed with the click of a button. 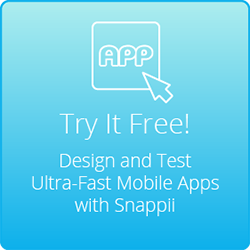 Visually developing apps on Snappii is significantly faster and easier method of development of feature rich native apps than using SDKs or Frameworks. 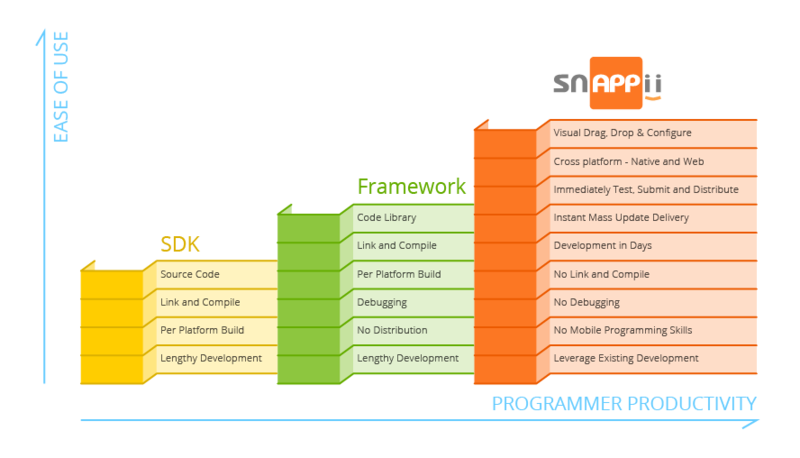 Development work that takes months to complete using SDKs can be done in just days with Snappii. App updates to all user devices can also be immediately distributed with the single click of a button. Build apps visually in the Snappii WYSIWYG editor, save and see the changes immediately on all test devices. 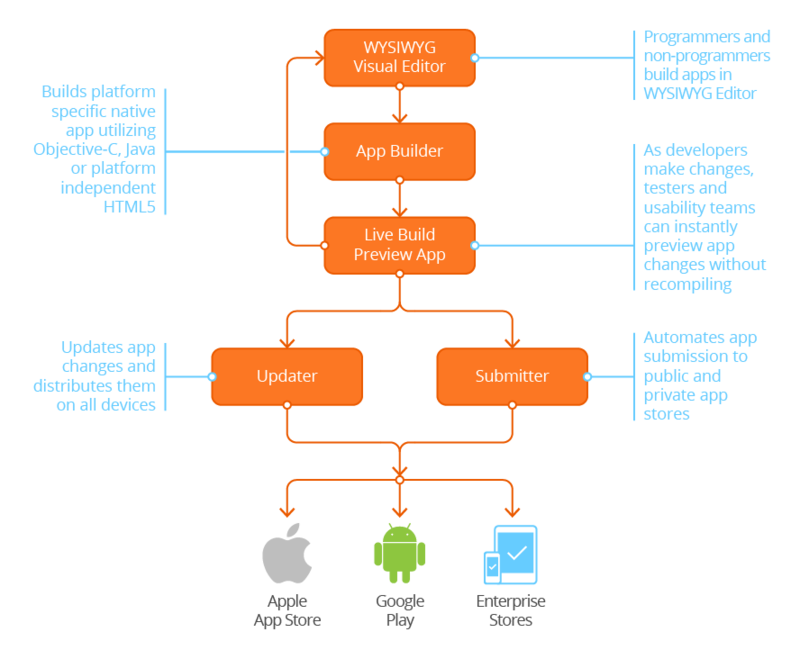 Submit apps to public and private app stores or update existing apps on the fly! 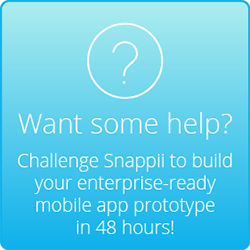 Snappii creates a distributed mobile app platform for maximum scalability, performance and code re-use. The architecture facilitates creation of enterprise apps that access data from back end and cloud based servers. Security and Encryption - To protect your data, Snappii apps offer Encrypted sessions, HTTPS communication, Access Control Lists to tabs and buttons, Login/Logout, and OAuth2 Authorization. Notification Service - Push Notification is a built-in technology in smart phones that allow pop ups to appear when notifications are pushed out. They are a great way to keep your users updated on the latest happenings with your business. Snappii users can send notifications right from the app. Location Service - Snappii apps use native Apple Maps for iOS and Google Maps for Android devices to show locations as pins on a map and provide directions. User Management - User Management gives one or more groups of users a different level of access to information and functionality within your apps. There can be predefined users like employees based on title/role who don't have to register in the app. They get access to apps just by logging in. You can also allow users to purchase a membership, for example, within the app and get assigned a member ID and expiration date either manually or automatically (based on your determination). You may also want to provide logged-in users with access to specific information you place within the app but do not want all users to be able to see. Snappii supports the O-Auth protocol for user validation providing the ability to log users into a variety of web based systems for authentication via LinkedIn, Twitter, Facebook, etc. Database services - Create custom lists for locations, products, services and employee data. Information can be easily created, added and edited as needed. You can create multi-level drill down layers of information to customize any data for your database. Data Source enables apps to work with data that is located in the Database created on the Snappii Cloud server or the data coming from external web services. Users can use Data Sources to store and retrieve data inside apps. The data from the Database can be populated from the advanced list and users can update these lists right in the apps. Another way to update a Data Source is by using an Advanced Form. The information in the Data Sources can be sorted, searched, edited, updated, and deleted, it is stored on devices, uploaded from a computer and can be sent via email. Everyone can use data from Data Source practically in all standard elements (YouTube button, Map, RSS, Twitter, etc.) to increase the app functionality. Web Services – Connect your apps to websites, web based applications and on – premise enterprise systems with RESTful API web services. Send and retrieve critical information and mobilize business processes. With Snappii it is now possible for customers to connect native apps with different RESTful API web services. There's no need to be a programmer or have any development skills to be able to create an XML data connector and add a web service to an app. Snappii has several pre-built XML connectors you can implement within your apps. If you need a connector that we have not supplied, simply follow our step by step instructions on how to create a new connector to suit your needs. You create a data connector that is an XML document which specifies how to “talk” to a web service. Once the document is imported into Snappii and appropriate security is enabled, any app can receive and update data in any systems. You are a car dealership owner and you have a list of all cars in an app. Until recently you had to upload a new spreadsheet each time you had a new car or needed to remove the sold cars, change price, etc. Now all you need to do is to add/remove to the existing list right from the app. Your customers can sort the list by models of cars, year, vehicles type, or any other fields. Any field that you used in the spreadsheet will be searchable. Forms collect information from users, for example, registration fields, scheduled appointments, applications, submit request, and more. Form fields allow you to make calculations, collect feedback from users, get copies of sent out forms, and more. The data can be received in PDF file, Excel spreadsheet or in the body of an email. The form can go to several email addresses that you specify. Using the Snappii platform, development teams can work collaboratively in parallel work streams. The Snappii WYSIWYG Visual Editor and the live build Preview App enable teams to build and update apps quickly, instantly view changes on their devices and provide immediate feedback. 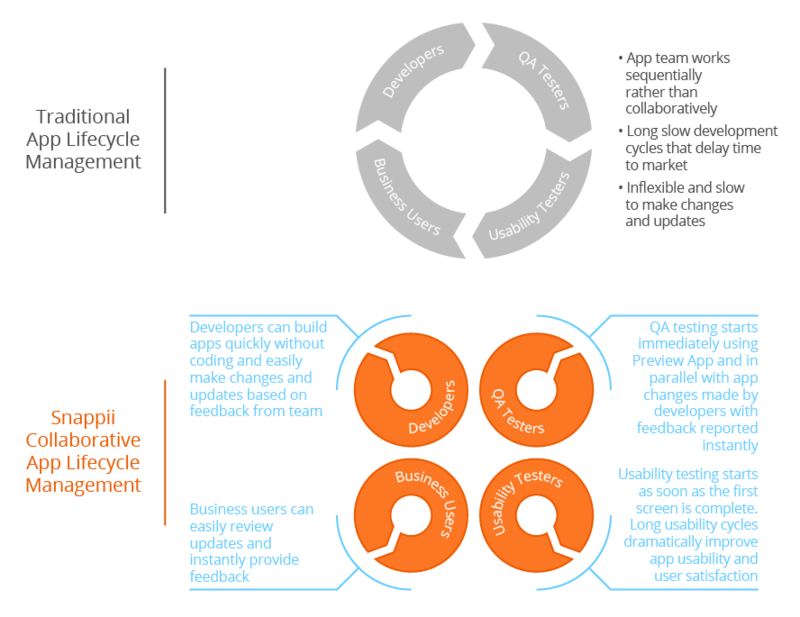 This dramatically compresses the development cycle, improves time to market, and lowers costs. 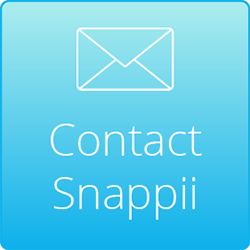 Contact Snappii to learn how businesses and organizations can quickly design, configure, integrate, deploy, manage, and evolve robust enterprise apps across multiple devices – no coding required.